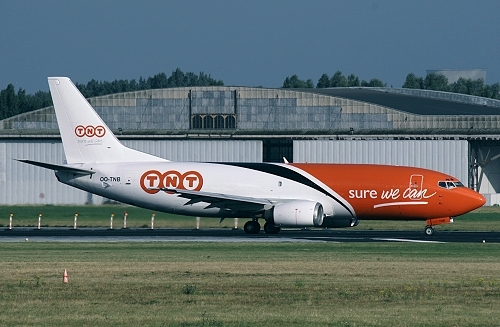 Description: the second TNT Airways Boeing 737 freighter was delivered at Liège on December 12 2003. Description: since July 24 2008 with revised titles. 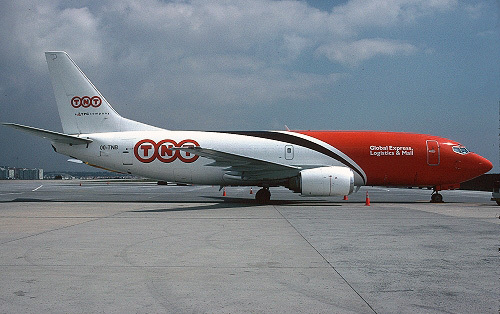 On October 12 2013, it made its final commercial flight for the parcel carrier. On the same day it was ferried to Brussels and was laid up. On November 13 of the same year it made a test flight and was the following day ferried to Woensdrecht for paint of its new operator "West Atlantic Airlines". Nine days later, it came back at Brussels, still with the OO- registration. It left for Coventry on December 7 2013 where two days later it was cancelled to "G-JMCP".